The kitchen is often the busiest room in your house. That means your countertop material will have to withstand hot pots and pans, wet dishes, spills, and regular food preparation. The perfect countertop should look great and be functional at the same time. 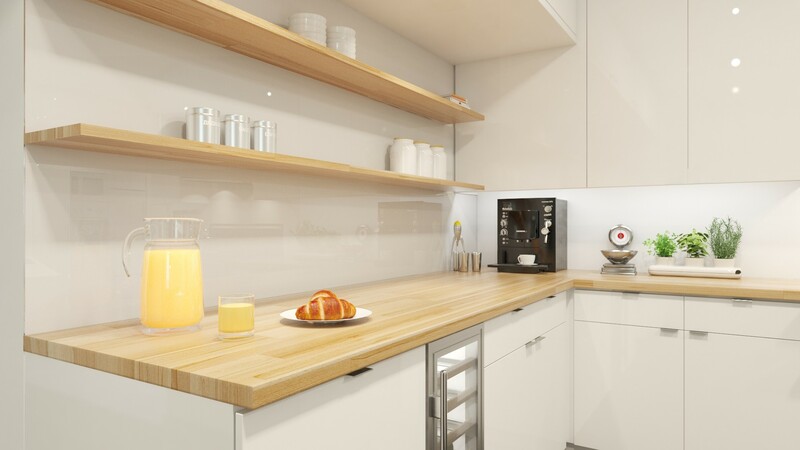 Familiarize yourself with the best kitchen countertop options so that you can decide which one is best for your budget and lifestyle. 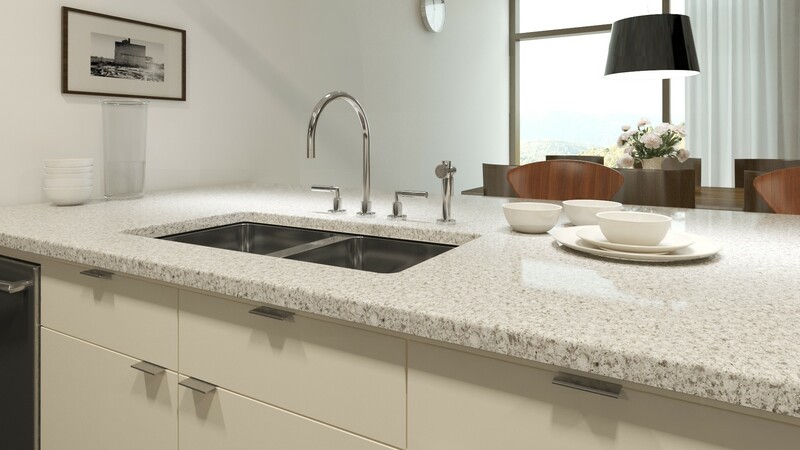 Quartz is one of the most popular kitchen countertop options today. Quartz refers to an engineered stone, which is made by combining ground quartz particles and resins. It is one of the most practical countertop materials, due to the low maintenance and high durability. Quartz does not require special care – such as sealing – and is easy to clean. Appearance: Quartz can mimic granite, marble or any other natural stone and comes in an extensive variety of colors and patterns. 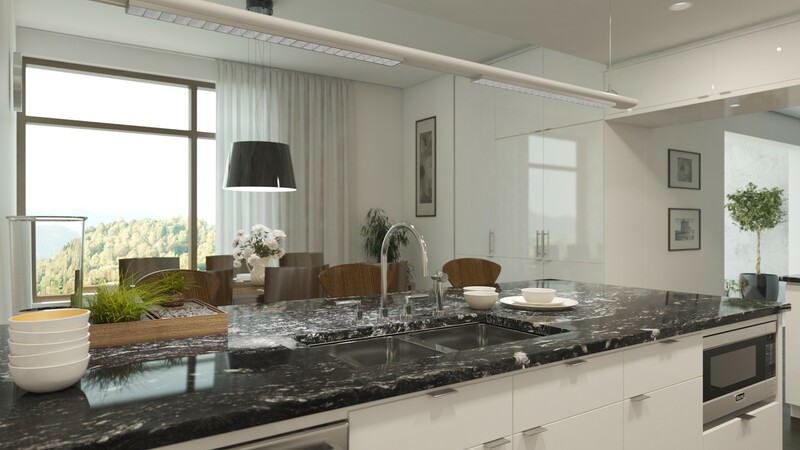 More and more manufacturers are developing countertops that look like natural stone. 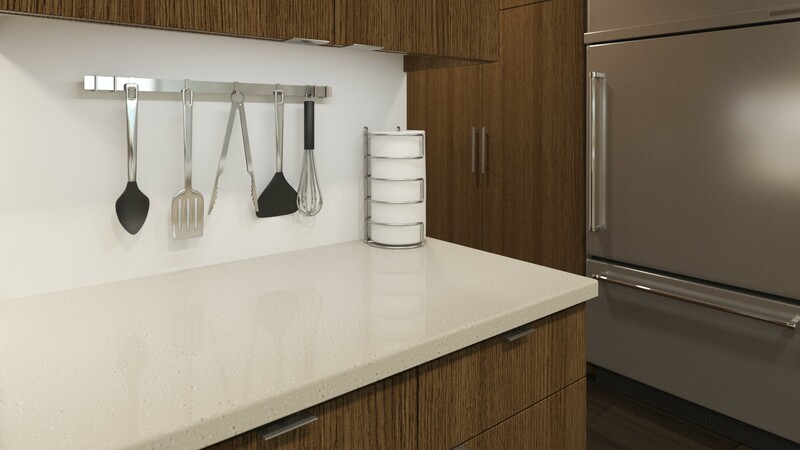 Durability: Engineered quartz is one of the most resilient countertop materials available on the market. Because of its low water absorption, it doesn’t need to be sealed and is highly stain resistant. Still, it’s not infallible. Using abrasive cleaners is not recommended, as they will eventually dull the stone’s finish. Leaving hot pots and pans on the countertop can also mar the color over time, and excessive cutting on the surface can lead to scratches. Corian is a synthetic polymer that falls under the category of solid-surface countertop materials. Its other applications include backsplashes, shower walls, and sinks. Corian is nonporous and withstands heavy use. While it can withstand heat of up to 212 degrees Fahrenheit, it’s not recommended to leave hot surfaces on Corian for extended periods of time. Because this material is water resistant, it does not harbor bacteria, and it is easy to clean with everyday household cleaners. Appearance: Corian comes in a variety of colors, often in consistent patterns. Backsplashes and sinks may be integrated into the overall design, providing a uniform look throughout the kitchen. Durability: The surface highly is stain resistant, and will not be damaged by household acidic substances, such as vinegar or lemon juice. Corian countertops can be professionally refinished should they become nicked, and your average everyday cleaner will get rid of even the toughest stains without a trace. Granite is the most durable natural stone natural stone that comes in slabs, which are cut to size to fit any kitchen countertop needs. Granite is resistant to heat and scratches, and comes in hundreds of unique colors and patterns. However, the material is porous and must be sealed. Taking this simple precautionary step can prevent stains and help maintain the stone’s finish. Appearance: Every piece of natural stone is different, and no two countertop surfaces will be exactly the same. Granite can be consistent in pattern, or have a veins and swirls. The wide range of colors and patterns will provide homeowners with the special look and feel they want to achieve. Durability: One of the reasons granite is such a popular choice is because of its incredible durability. Hot items can be set directly on granite surfaces, which makes the material one of the more convenient countertop choices. Although you can cut directly on the granite surface, it’s not a recommended practice as it will dull the blade of the knifes. Sealing granite countertop every 6-12 months is recommended practice by professionals. Marble is an iconic kitchen countertop options, and its appearance can be stunning. This natural stone is warm and full of character. Marble surface stays cool even in the heat of summer, which can give you the motivation to turn on the oven in the middle of a heat wave. But marble isn't the easiest surface to maintain. It’s soft and porous and like granite it must sealed to avoid staining. Acidic substances, such as citrus juices, wine or milk, spilled on the stone should be cleaned immediately to avoid etching. Marble is also soft, which makes it prone to chipping and scratching, however these imperfections give it a charming look over time. Appearance: Marble slabs come in many colors, usually with a certain amount of irregular veining. Classic marble countertops are often white with subtle gray veining, but options in beige, brown and black are becoming popular as well. Durability: Marble is one of the softer options for countertops when it comes to natural stone. Therefore, it’s more likely to get scratched, dinged, and stained with regular use. Marble can be purchased with a polished or a honed finish. Honed marble has a dull surface which helps to hide some scratches and etching. Polished marble is glossy and more resistant to staining than honed marble. Not to be confused with quartz, quartzite is a natural stone that has a neutral color and swirling veins, which are reminiscent of marble. It’s fairly resistant to heat, but like marble needs to be sealed on regular basis. Most quartzite countertops will have a sparkling surface when light is reflected of its surface due to quartz crystals in the stone. 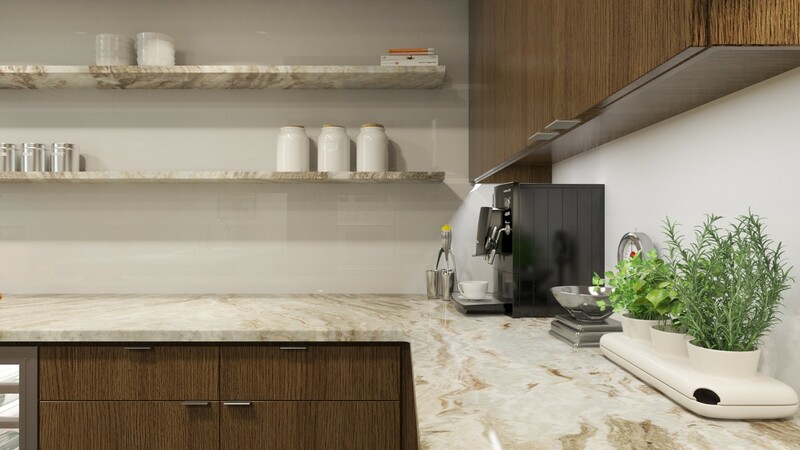 Appearance: Quartzite countertop materials are usually white with gray undertones. The stone is fairly light and may include faint rosy or blueish hues. Veining can vary from very subtle to prominent. Quartzite use as a countertop material is relatively new, however it’s quickly taking over the market as an alternative to marble. Durability: Quartzite is harder than marble and is less prone to chipping, however it’s very porous. It’s important to seal the stone on regular basis to maintains is natural beauty. Average Installed Price: Starting at $50 per square foot. Butcher block is one of the most forgiving countertop choices. It’s meant to take a beating, yet butcherblock is also attractive and will compliment sleek, contemporary décor as well as rustic styles. Butcher block countertops aren’t pretentious, and they fit nicely into any home, from cottages or sprawling villas. This material is one of the more functional countertop choices, it practically invites you into the kitchen to whip up something delicious. Appearance: Butcher block will warm up your space with natural wood grain. The color and finish may vary, it’s a versatile choice for homeowners looking to spruce up their kitchen. Butcher block can have a rough working surface or a polished finish. Durability: Butcher block kitchen countertop options are not easily damaged by acids, but they’re porous and can soak up spills. If not properly maintained the countertop is prone to developing mold if exposed to moisture for a significant period of time. However, if needed butcherblock countertops can be sanded and refinished more than once. There are many wood species that can be used as countertops, African mahogany, cherry, walnut, teak, exotic or reclaimed wood are all popular countertop surfaces emerging on the market. You’ll have a wide range of countertop choices if you’re looking to use this traditional material as well. When it comes to maintenance, wood isn’t fussy, you can sanitize it with lemon or vinegar to minimize bacteria growth. Regular sealing is recommended to prevent it wood from absorbing moisture. Appearance: The beauty of wood lies in its natural qualities and every species bring unique look and qualities to the table. Colors can range from coffee to cream, and the grain can be pronounced or subtle. Sealed countertop will appear darker than an unsealed one. Durability: The durability depends on the type of wood that’s used. Hard maple, walnut, zebrawood and tigerwood are tough and resistant to abrasion. Teak is easy to finish with oil and repels moisture. Chestnut is a salvaged wood adds rustic appeal and camouflages damage. Research on the type of wood used is a must, it will guarantee that the choice made is suits it’s owner’s lifestyle and budget. Average Installed Price: Starting at $40 per square foot. Many people are choosing this environmentally friendly option for their kitchen countertops. It’s very fast-growing natural material, which makes it one of the greenest countertop choices. It is harder than wood and is often compared to steel in that department. Bamboo countertops are naturally anti-bacterial, but they need to be sealed frequently to resist staining and maintain their immaculate appearance. Appearance: Bamboo grasses are narrow, and they must be fused together to create a solid surface. They may be assembled in a variety of ways, adding interest to the countertop with varying patterns. You can choose from vertical grain, horizontal grain, end grain and strand-woven countertop surfaces. The grain and design add a contemporary, natural and clean flair to your home. Durability: Bamboo is resilient and long-lasting. Even though it’s harder than most woods, some people find bamboo to be high-maintenance, due to constant need of sealing. It does not withstand heat well; sharp objects will cause scratches. If it does become damaged, it can be sanded and refinished. Many recycled materials can be used to construct kitchen countertops. The most common types include ceramics, glass and even paper. Paper countertops are referred to as composites. If you prefer environmentally friendly options, look for those that are made with non-petroleum resins and natural pigments. 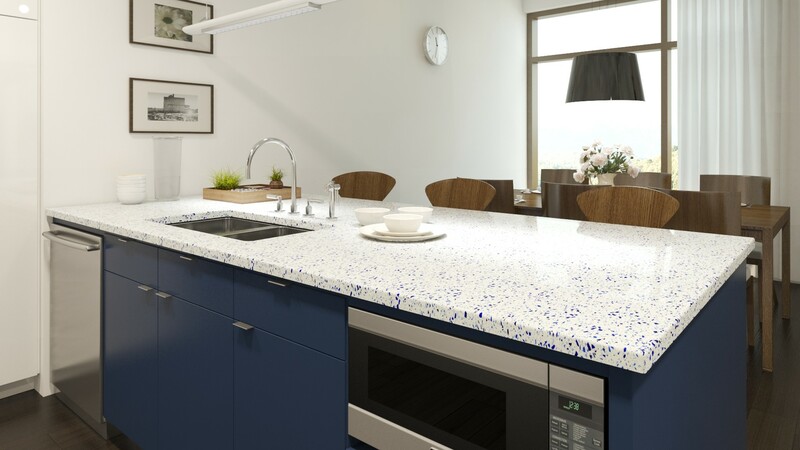 Appearance: Recycled glass and ceramic countertops can be made of large shards or ground powder, delivering a variety of textures and styles. You may prefer the look of a colorful, chaotic mosaic or a monochrome, luminous finish. Recycled glass catches the light and has rich depth. Recycled paper on the other hand usually offers a smooth exterior that can be finished with any color. These kitchen countertop options are usually made with dark, solid colors with slight tonal variations. They can look similar to laminate. Durability: The sturdiness of recycled countertops varies based on the material and construction method. Glass countertops may be less heat-resistant than paper ones; glass can crack when it’s exposed to extreme temperatures. These countertops don’t have to be sealed or waxed. Composite paper countertops are surprisingly durable. They’re harder than wood, and they’re non-porous. Therefore, they don’t absorb water or stains, but they can develop spotting if they’re not dried right away. They can withstand heat up to 350 degrees Fahrenheit and wipe clean easily. They do require a regular application of sealant to retain their water-resistant properties. Although concrete sounds like it belongs in a warehouse or industrial area, this hassle-free material is becoming a popular choice for countertops in residential homes. It’s far from flashy, and different pigments and finishes can be added to ensure that your countertop surfaces don’t resemble a sidewalk. Concrete is also environmentally friendly because it’s essentially a combination of renewable materials, such as rock, sand and cement. It can be customized with a variety of colors and textures, and it stands up to the heaviest use. Appearance: Concrete can be finished to look like almost anything. It can resemble natural stone or marble or have a smooth, uniform facade. It’s not always perfect, and its charm lies in its imperfections. You can choose to have it polished to shine like a mirror or add bits of other materials to add variation or sparkle. Durability: Since concrete is porous, it needs to be sealed to prevent bacteria growth and staining. Certain finishes are more susceptible to water and food damage than others. Concrete can also develop hairline cracks. If it’s installed and maintained properly, however, it’s one of the toughest kitchen countertop options that you can get. Tile is making a comeback in kitchen countertops. They’re easy to install and cost effective. Most kitchen tiles are ceramic, but you can find tiles made from wood, glass, cement, stone and bamboo. The appearance, durability and price vary based on the material. Appearance: Tiles are usually square or rectangular, with defined grout lines between each piece. This creates an uneven top that’s not ideal if your countertop surfaces double as a location for writing checks or doing homework. Durability: Tile countertop surfaces are as durable as the materials from which they’re made. If you don’t clean the grout lines, they can accumulate crumbs, moisture and dirt. Tiles may also chip or become damaged more easily than slabs of the original material. On the other hand, you can often replace one tile if its broken or stained. Laminate is available in more colors and patterns than ever before. 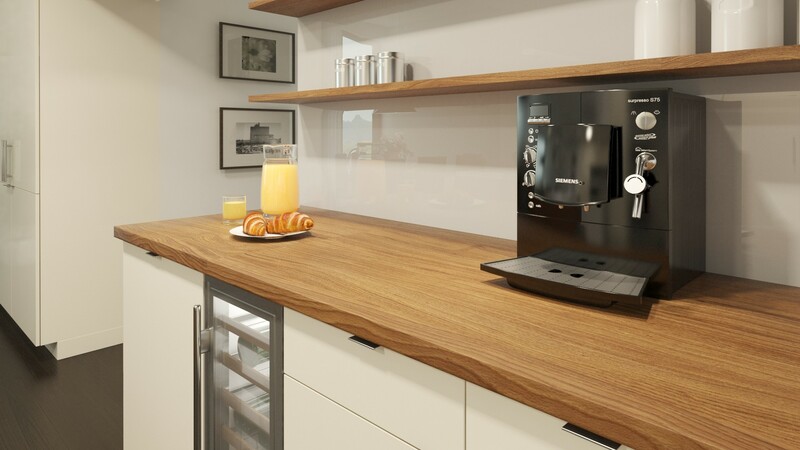 It’s fairly hard-wearing and it’s one of the least expensive kitchen countertop options to purchase, install and maintain. It’s a budget friendly countertop option that many homeowners explore. Appearance: Laminate can be made to look like anything, making it one of the most accommodating countertop choices. Faux finishes make some laminates hard to distinguish from stone, bamboo, wood, or marble. Laminate countertops are available in solid colors or subtle patterns. Durability: Although laminate used to be prone to scratches, modern sealants have improved its ability to withstand most kitchen hazards. You don’t need to do anything to maintain these countertop surfaces, and you can abrasive household cleaners or bleach to clean them. One thing to watch out for is hot items, which can scorch or burn the finish. Laminate can also chip at hard edges, which is why many consumers choose rounded profiles. Average Installed Price: Starting at $25 per square foot. Soapstone is a softer natural stone. It’s well-suited for rustic kitchens and many say that it offers more warmth than other stone countertop choices. It’s easy to clean, and you can set hot kitchenware on it without damaging it. Appearance: Soapstone is usually dark gray or green and has light gray or white veins running through it. The marbling can be intense, or you may find a piece of soapstone that has a fairly uniform color. The thickness of the slab can vary depending on user’s needs. Durability: It’s non-porous and doesn’t require the sealing that other natural stones need to repel stains and keep bacteria out. Soapstone however is prone to chips and scratches, because it’s fairly soft. It can be re-polished if scratches are too prominent to minimize the visible damage. Average Installed Price: Starting at $55 per square foot. You’ll often find stainless steel in restaurants and professional kitchens because it’s non-porous, easy to clean and heat resistant. Thin steel sheets are affixed to an underlay that’s usually constructed of wood. The seams can be welded for a completely seamless surface. Appearance: Steel can be matte or shiny. The reflective face gives it an industrial feel. 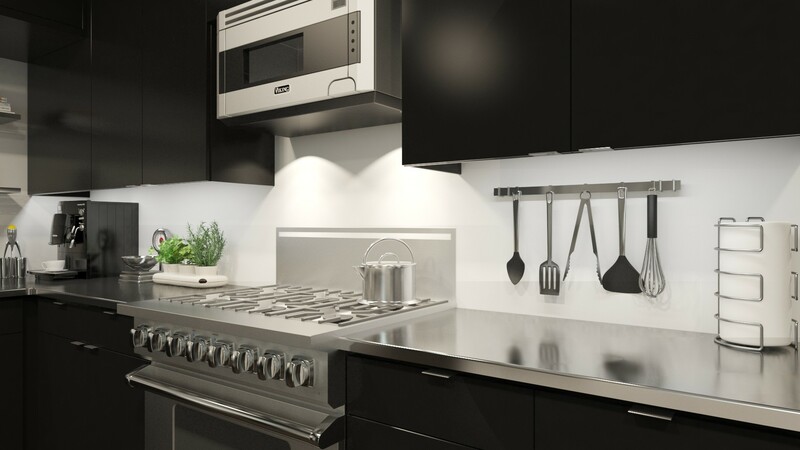 You can find hammered or smooth stainless-steel countertop choices. Hammered steel may hide imperfections better than its flat counterpart. Durability: The durability of the steel depends on the grade and finish that you choose. The best kitchen countertop options use type 304 because it is tough and scratch resistant. Steel can be wiped down with almost anything, but it can be damaged by bleach and marred by abrasives. Average Installed Price: Starting at $70 dollars per square foot. Copper comes in sheets that are attached to a backing and kills bacteria that sit on its surface. You can clean copper easily with salt and lemon juice. Although you don’t have to seal or wax copper, you may do so if you want to slow down the development of the patina. Appearance: Copper has a warmer hue than steel. It develops a patina over time that gives it a mottled appearance and can change its color to reddish, grayish or green. 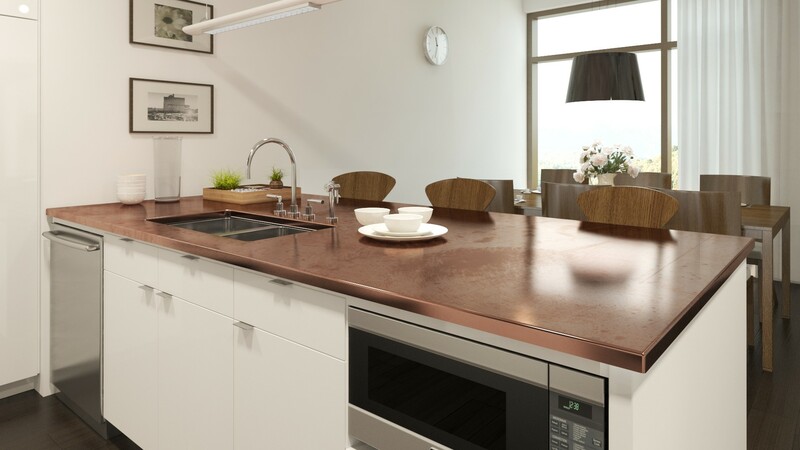 Durability: Although copper is durable, it’s one of the most easily dented countertop choices. This adds to its distressed appearance as it ages and isn’t always considered to be a detriment. Average Installed Price: Starting at $100 per square foot.